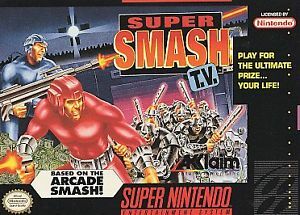 Super Smash TV for Super Nintendo allows you to make their way from soundstage to soundstage throughout the studio, squaring off against the most powerful metal beasts the network could round up. Smash TV features more than 45 levels of carnage, with bonus stages and fierce boss battles before the contestants can claim the big prize. For 1-2 players.